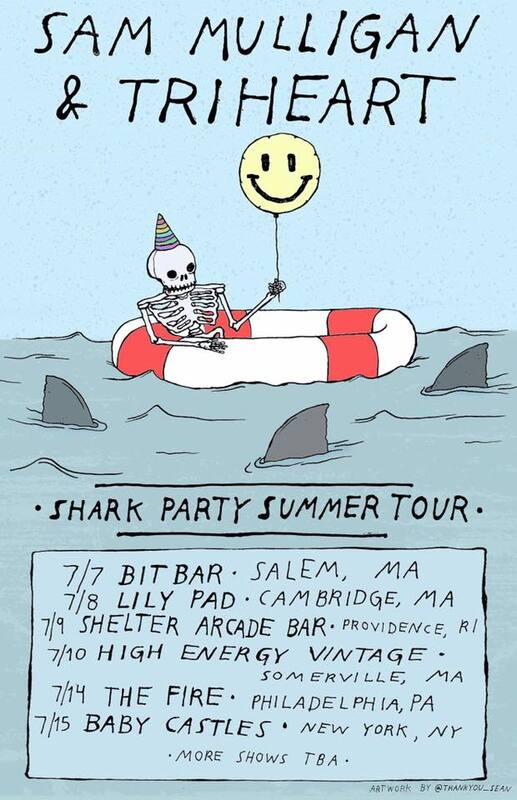 Sam Mulligan: Shark Party Summer Tour! On this tour you will hear many songs that aren't on my album, Big Hand Band Van Man, which I released in 2013. Yeah, it's been a while. Sorry about that. BUT I have made a bunch of songs in the interim, on various compilations and whatnot, as well as songs that I have been playing live for far too long, and a few that you've likely never heard. 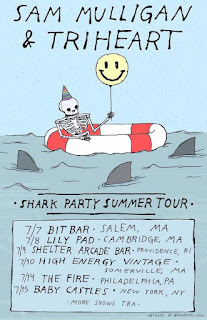 I've been working hard (delayed slightly by a broken collarbone and subsequent surgery and recovery) on recording for the past month or so, and am almost ready to release my compilation of all of these songs on my album, "Shark Party". I'm still thinking about how I am going to release it, and will be sharing details soon, but am very excited for y'all to hear it! Grant Henry (aka Stemage) has remastered the first half of the album, and these songs sound better than they ever have before. "Shark Party" is 15 tracks, and will feature album artwork by Joshua Porterfield (it is sooo cute), lettering by Coco Roy, layout by Avi Paul Weinstein, and I'm hoping to release it in physical form as a tape cassette, and digitally on Bandcamp. Side 1 of the tape will be singles that you may have already heard on other compilations, and side 2 are all previously unreleased songs. I am so excited to finally release recorded versions of "Shark Party" and "Time Warp", I've been playing those songs for almost 4 years and am really happy with how everything is sounding! More updates real soon, and I really hope to see y'all at these shows!